Novomatic merged two epochs, which held the Olympic competitions in a new game. Modern and ancient Greek games attributes depicted in the game. Players expect an exciting game on 5 reels with 9 paylines. 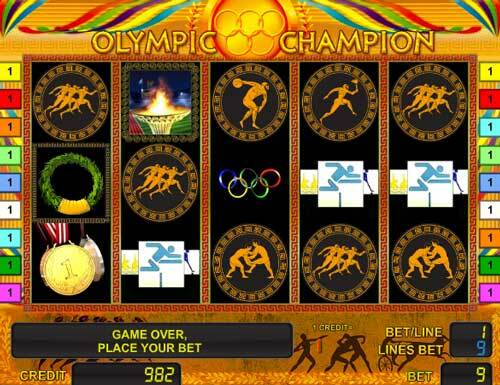 In addition, Olympic Champion slot machine gives signs of Wild and Scatter, Free Spins bonus mode and round to double. Rotation accompanied by soft music that allows you to enjoy playing Olympic Champion online even free. Receiving profit of symbol sequences, the player can press a button to take the win, to or take a chance of doubling clicking "gamble". In the risk game need to trust intuition and try to guess the color of the blinking card. In the case of a correct choice, previously obtained the prize multiplies by 2. Otherwise, it will be lost. Three or more images with a laurel wreath anywhere on active paylines grants a player with 10 free games, which held accordingly to the last bet. At this time, wreaths receive function of a wild symbol and can replace any other symbol to complete a winning combination. Olympic Champion slot restarts extra free games if one time more scattered wilds appear on the lines. Do you want to take a part in the Olympic Games? Then play Olympic Champion slot online in your browser and enjoy virtual sports games, which pleasantly surprise with good prizes.